Tumor, ovary, endodermal cells, yolk sac, endodermal sinus, germ cells. Ovarian endodermal sinus tumors are a neoplasm of germinal origin derived from the primordial cells that during their migration from the caudal area to the gonadal region undergo mutations that progress to become malignant cells that proliferate constantly. Appearance is unilateral; it is considered the germinal tumor with the highest malignancy rate. (20%) Early diagnosis could increase patient survival. An exploratory investigation included the five last years in the pubmed, science, and Cochrane was carried out to evaluate the evidence of the diagnosis and / or treatment of these tumors. It was found that mortality is due to delayed diagnosis and ineffective treatment. It is necessary to determine the chemotherapy treatments that effectively attack this type of neoplastic cells, which behave differently from other types of tumors. Keyword : Tumor, ovary, endodermal cells, yolk sac, endodermal sinus, germ cells. According to the world organization of health in the histological classification of germ tumors, three categories are described: 2 , 1 Primitive germ cell tumors: Disgerminomas, which are usually bilateral even in 10-15%, yolk sac tumors, known also as endodermal sinus tumors, embryonal carcinoma, polyembryoma, non-gestational choriocarcinomas and mixed germ cell tumors. 2) Biphasic or three-phase teratoma: immature teratomas and solid or cystic matures (dermoid cyst). 3) Monodérmico teratoma and somatic tumors associated to dermoid cysts: carcinoids, thyroid group, melanocytic, tumors of the neu-roepitelio, carcinomas, sarcomas and others. The purpose of the research is to provide the medical area with essential information for the management of endodermal breast tumors, to determine which treatment based on chemotherapy would be the most appropriate for this type of neoplasms. We agree with the literature consulted that not only endodermal sinus tumors but all neoplasms and mainly those of germinal origin, should be diagnosed opportunely, since this is the main factor that could be indicative of a good prognosis, giving knowing the characteristics of this type of neoplasms, the age ranges in which they are presented, the confirmatory tests and the specific treatment, are a very useful tool that can contribute to improve the quality of life of the patients after their diagnosis. 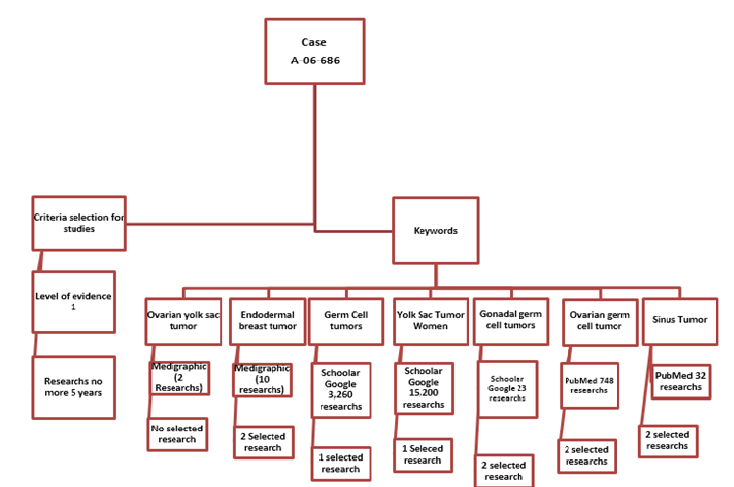 The research focused on the type of specific treatment that could be used as a first tool to combat this type of cancer, so the literature review of a broad field of research based on reliable information bases was carried out in order to distinguish in first stay what are the signs and symptoms of this condition, how often it can be given and in what age of the population it is easier to be present. Ovarian endodermal sinus tumors are a neoplasm of germinal origin that have a rapid progression which determines that the diagnosis must be early and the treatment to be applied must be specific for germ cell tumors, since after the investigation it was found that they respond differentially to different types of chemotherapy treatments because their origin and structure differ from other types of tumors. They are infrequent but their level of malignancy is related to late diagnosis and poor treatment applied, they occur mainly in childhood and in young age having their highest incidence around 20 years of age. The treatment of these is based on surgery and BEP chemotherapy (bleomycin, etoposide and platinum). It was found that the combination of these drugs plus early diagnosis determines survival to this condition. Most patients with advanced or recurrent CCC have a low benefit-to-failure ratio from palliative CT. The role of RT and targeted agents must be explored to improve clinical outcomes for such patients. It is essential that health personnel have knowledge of the specific treatment of germ cell tumors, since this could contribute to the rejection of treatment and in turn become a determinant for the survival of patients.